Out of all the vessels John Tait built, three in particular gained fame in Prince Edward County. Tait's most famous schooner was called the C. Gearing. It was a schooner built for George Hicks and Colin Gearing (the boat's namesake) in 1869, the height of the Barley Days. It had a 9 000-bushel capacity and often carried that much during the trips it made between Picton and Oswego three times a week. The C. Gearing was a speedy schooner, once travelling from Oswego to South Bay in a record time of four hours. The C. Gearing managed to make $6 000 one fall when barley freights were high, due to its efficiency and speed. Of all the C. Gearing's accomplishments, it is no wonder that people from all over Prince Edward County turned up for its launching. But the C. Gearing's glory days did not last forever, and the ship burned in Trenton because of old age. The J.N. Carter was another Tait-built schooner. The boat was built in Picton (1875) and was rumoured to "not [be] surpassed anywhere on the Lakes". But the J.N. Carter's life was not without problems. In 1878, a fire in the J.N. Carter's forecastle caused $600 in damage before it was extinguished. This amount must have been a fortune for the schooner's owner, Thomas J. Welbanks. 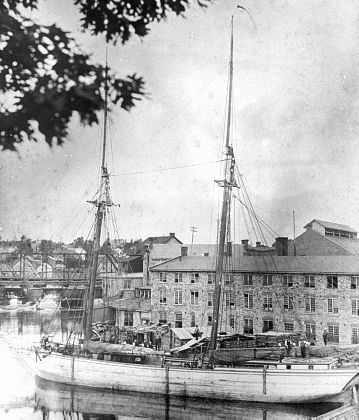 The Olive Branch was built in 1871 by John Tait to be another Lake Ontario barley freighter. But unlike its name, the way the Olive Branch met its end was hardly peaceful. It departed Oswego for Portsmouth (near Kingston) on Sept. 30th, 1880 despite storm warnings and was simply never seen again, because it sank ten miles off Main Duck Island. Captain John Walters of the schooner Picton was on his way to pick up farmers on Main Duck Island when he noticed the topmast of a vessel bobbing in the water. Upon closer inspection, Walters realized that an entire schooner had sunk and he brought a sodden cone of bunting back to Picton with him for identification purposes. A woman named Mrs. Dix had sewn a new fly for the Olive Branch that summer and recognized her own handiwork. The mystery was solved. It did not vanish into thin air, it had sank, taking the crew down with it. A.W. 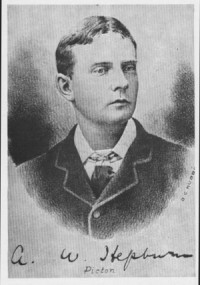 Hepburn was the second-most important Prince Edward County shipbuilder of the Barley Days. 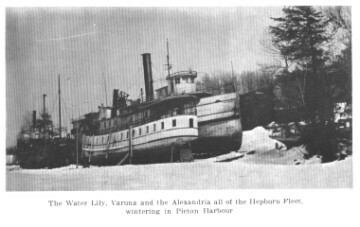 One winter, Hepburn was able to hire 109 to repair ships on his yard. He was involved in the coal and lumber industries, as well as the shipping industry. He ran a swift business with a small fleet that carried passengers and freight across the Great Lakes. In 1914, the Ontario and Quebec Navigation Company bought out the Hepburn fleet. The Canada Steamship Line later purchased the Ontario and Quebec Navigation Company. * [back] - This project was developed by Isabel Slone (one of the Society's 2007 "summer students") and was in part funded with a grant from Young Canada Works, in part with a grant from the Municipality of the County of Prince Edward, and in part with this Society's research funds.